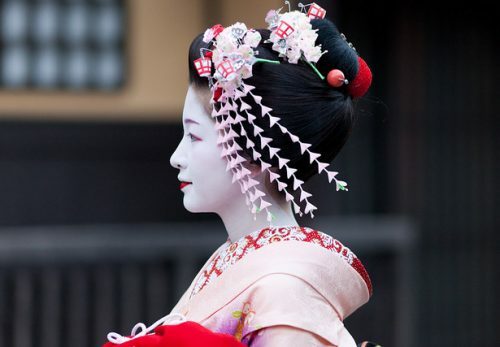 Maiko with arranging hair like ‘Ware shinobu’ style,wearing red neckpiece called ‘haneri’ and putting red rouge only under her lower lip are standard style of less than a year career Maiko. 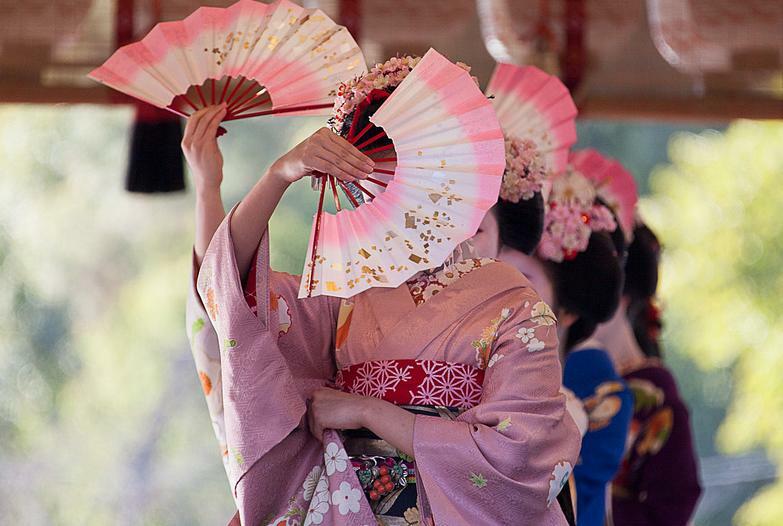 In that stage,they could finally serve at Ozashiki so now their professional career has been started. 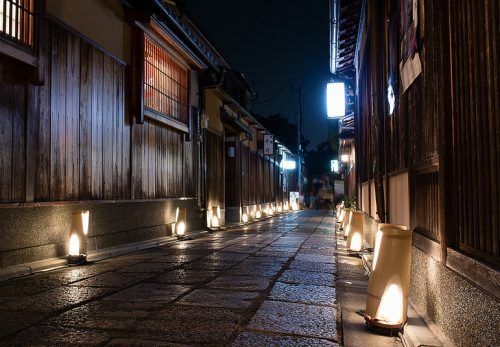 The way to Ozashiki from Okiya, new Maiko has to walk very back if they walk with their senior.And when there are door or Noren( curtain ), new Maiko has to go the front of the line quickly and quietly then help to let them go easily. 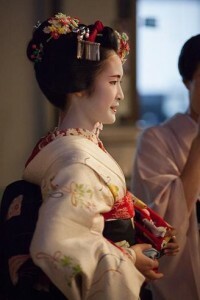 At ozashiki, new Maiko has to do things before senior does. 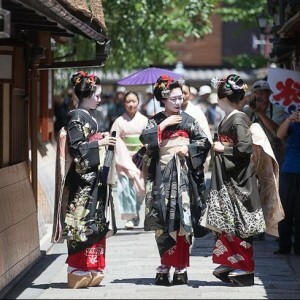 Besides new Maiko has to say hello to Mom of Ochaya, Nakai san, Chihou san who play shamisen at Ozashiki. 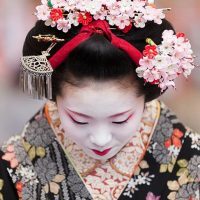 There are lots new Maiko’s tasks and they cannot forget any things. 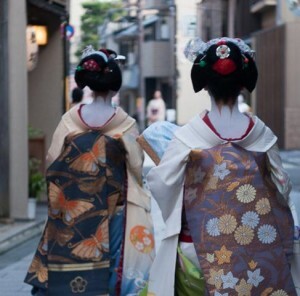 New Maiko always have to concern about Mom of Ochaya and senior.Also they have to think about what customer need.. You can guess how mach pressure and stress new Maiko feel. 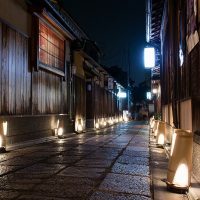 Here is one fresh Maiko’s story… there are many exactly same room door in Okiya, New Maiko walked out the door then go to kitchen to have another Sake, then she would come back to the room but actually she came back different room…, customers were surprised the new Maiko came into and just sat next to senior Maiko saying nothing. 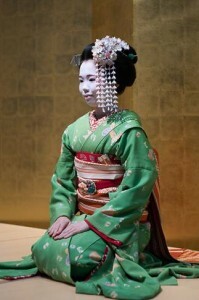 New Maiko did not noticed she was in the wrong room because she was too nervous! Finally senior Maiko and Mom started laughing! 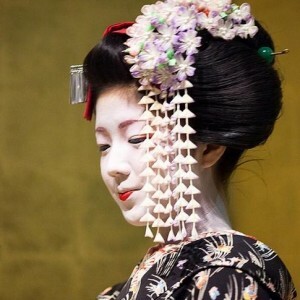 It is tough for Maiko not only Ozashiki but also some other things..
New Maiko have overcome such days then finally some of them would have ‘Omise dashi'(maiko debut) in about a year. When they reach the stage they are allowed to put red rouge both lips. 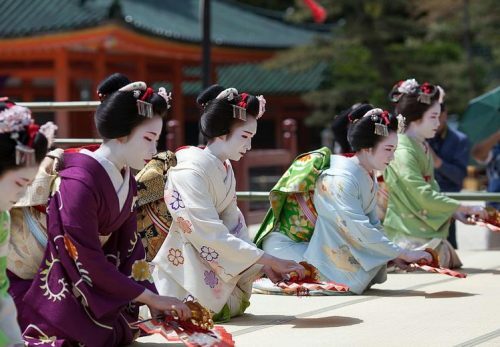 When Maiko has their juniors, they become senior Maiko. but it also make them feel like they have to work hard more. As time goes by, their collar would change to white from Red, hair style changed to ‘Ohuku’ . meanwhile their mind changed to senior as well.